There are some activities a card-carrying Celiac learns to do without - activities that are staples of twenty-something culture and the benefits of living in a bustling city with lots of food options. Thankfully, though, there are restaurants in Philadelphia willing to go against the grain. With the safe haven of Snap Custom Pizza's Rittenhouse Square location open until 3 a.m. on weekends and the plentiful selection of gluten-free bagels and a dedicated toaster at Schmear It in University City (admittedly I’ve only ever ordered to my bed via UberEats), gluten-free patrons have more morning and late-night comfort food options. Add to that list Fishtown's Front Street Cafe (1253 N. Front St., 215-515-3073), where the dinner selections exceeded my expectations of what’s available to gluten-free diners. 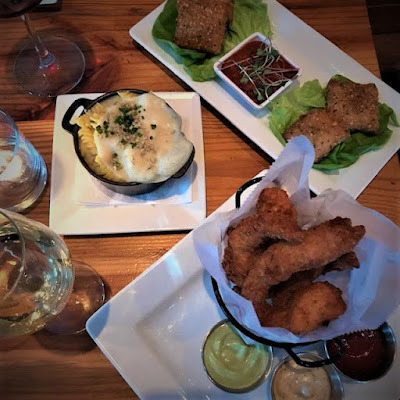 A plentiful number of dishes on the menu are punctuated by a “GF,” including usually elusive offerings such as mac ‘n’ cheese, chicken tenders, crab cakes and - most important to me - fried mozzarella. I couldn’t remember the last time I was able to order my once-favorite appetizer in a restaurant, and Front Street’s crunchy, dippable fried squares did not disappoint. A friend and I visited Front Street this past Sunday, when we were excited to order dishes that would help soak up the remnants of St. Patrick’s Day celebrations. 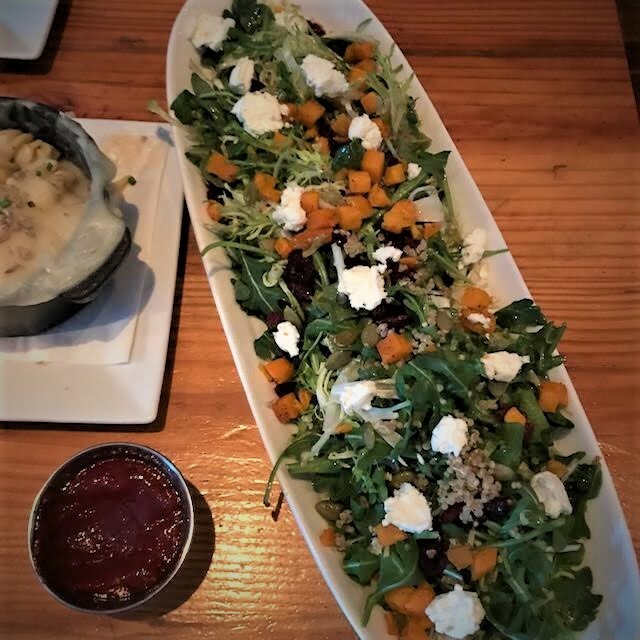 We shared the chicken tenders, mac ‘n’ cheese, fried mozzarella and, for good, green measure, the Harvest Salad. The portions were sizeable, but not overwhelming, and definitely flavorful. If you didn't look closely at the menu, you may not have known that these dishes were not only gluten free, but also vegan, with creamy, stretchy cashew cheese in place of standard cheddar and mozzarella. Our server told us that items marked “GF” were already gluten free, but that other choices, like sandwiches, could be prepared with gluten-free buns or bread. She also let us know that the kitchen utilized a dedicated fryer and that their dedication to gluten-free options (and other restrictions and allergies in general) was an important point of pride for the restaurant. Front Street’s largest selection of gluten-free food is offered on their dinner menu, but they also have options from breakfast to late at night. Front Street Cafe feels like many different restaurants glued together, yet it doesn't have an identity crisis. The variety ensures that your experience conforms to any occasion, rather than shaping your evening. For candle-lit romantic dinners, groups of friends meeting to enjoy the abundant selection of cocktails at the bar, or a fun meal before a concert at the Fillmore, Front Street is an excellent gluten-free option. Despite its cavernous space (there's outdoor seating in the summer) and out-of-the-way location, Front Street’s popularity makes it an appealing go-to spot, so be sure to snag a reservation. And don't forget to get two orders of the mozzarella squares just in case one member of your party eats all of them when no one else is looking. Hypothetically speaking, of course. Sara Blank is a 26-year-old agency copywriter living in Center City Philadelphia. She was diagnosed with Celiac Disease at age 18, right when "gluten free" entered the zeitgeist. Follow her on Instagram at @SarBlank.